The Minnesota Timberwolves brought NBA basketball back to the Twin Cities after 29 years without a team to call Minnesota--home. The Minneapolis Lakers bolted for Los Angeles in 1960, where there are no lakes. In 1989 the Timberwolves had their inaugural season. In the TWolves inaugural season they played their home games in the Metrodome, before moving permanently to the Target Center in 1990. On April 22, 1987 the NBA granted one of its four expansion teams--the others being the Orlando Magic, Charlotte Hornets, and the Miami Heat to begin play in the 1989-90 NBA season. There were two ABA (American Basketball Association) franchises: the Minnesota Muskies (from 1967-68) and the Minnesota Pipers (from 1968-69). In December 1986 the franchise conducted a "name the team" contest and eventually selected two finalists--"Timberwolves & Polars". 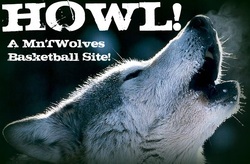 The team then asked the 842 city councils in Minnesota to select the winner as the "Timberwolves" won by nearly 2 to 1. The team was officially named the "Minnesota Timberwolves" on January 23, 1987. FUN FACT: Minnesota is the home to the largest population of timber wolves in the lower 48 states. The Timberwolves debuted on November 3, 1989--a road game vs. the Seattle Supersonics--a 106-94 loss. Five days later they made their home debut at the Hubert H. Humphrey Metrodome--another loss--this time to the Chicago Bulls: 96-84. It only took two days later however, for the TWolves to grab their first win--vs. the Philadelphia 76ers at home--125-118 on November 10.